HMS DIAMOND (D34) is the third ship of the Type 45 guided missile destroyers built by BAE Systems Naval Ships and launched on 27 November 2007, by Lady Johns. She was commissioned on 6 May 2011 and is the 12th ship to bear the name in Royal Navy service. Equipped with Sea Viper anti-air missile system and SAMPSON multi-function radar with a range of 250 miles. Her arsenal includes 15 Aster short to medium range and 30 Aster long-range missiles, with anti-ballistic capability. She is 500 ft long with a displacement of 8,000 tons and a top speed of 29 knots. Diamond carried out exercises with the USS Enterprise, during the destroyer's first operational deployment in the Arabian Gulf during 2012, which was the aircraft carrier's last deployment after 52 years. 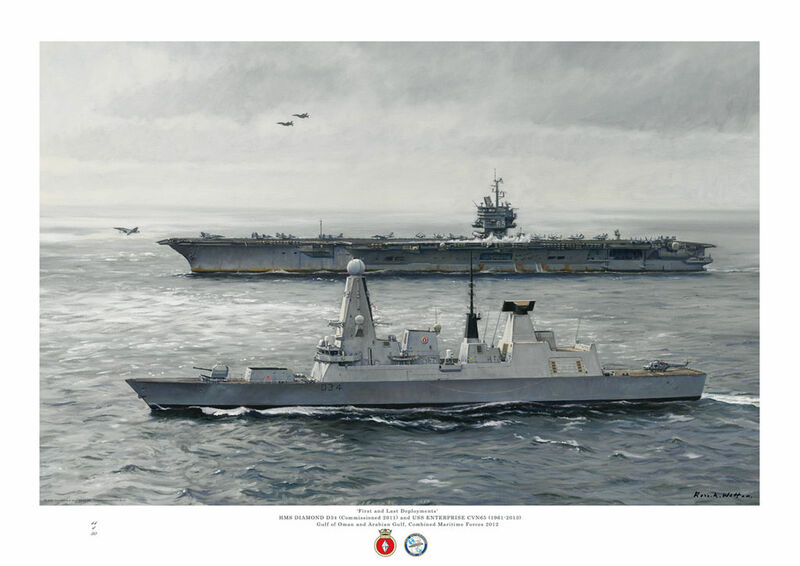 The original oil painting was commissioned by HMS Diamond.